4. Department of the second medical oncology, the 3rd affiliated Hospital of Kunming Medical University, Kunming, Yunnan, 650118, China. Triterpenoids extracted from Cimicifuga foetida have been reported to inhibit cancer by inducing cell cycle arrest and apoptosis. In this study, KHF16 (24-acetylisodahurinol-3-O-β-D-xylopyranoside), a cycloartane triterpenoid isolated from the rhizomes of C. foetida, showed potent anti-cancer activity in multiple ERα/PR/HER2 triple-negative breast cancer (TNBC) cell lines. KHF16 significantly induces cell cycle G2/M phase arrest and apoptosis in both MDA-MB-468 and SW527 TNBC cell lines. KHF16 reduces the expression levels of XIAP, Mcl-1, Survivin and Cyclin B1/D1 proteins. Importantly, KHF16 inhibits TNFα-induced IKKα/β phosphorylation, IKBα phosphorylation, p65 nuclear translocation and NF-κB downstream target gene expression, including XIAP, Mcl-1 and Survivin, in TNBC cells. These results suggest that KHF16 may inhibit TNBC by blocking the NF-κB signaling pathway in part. Keywords: KHF16, Cycloartane triterpenoid, Triple negative breast cancer, Cell cycle, Apoptosis, NF-κB. Breast cancer is the most common female malignant cancer. It is notable that women have the highest breast cancer incidence rate, which is the second highest cause of cancer death. The newest cancer statistics show that the risk of an American female developing breast cancer is one in seven . ERα/PR/HER2 triple-negative breast cancer (TNBC), which is a unique subgroup that accounts for approximately 15% of breast cancer, has a high histological grade, an aggressive behavior pattern and a poor prognosis because of the lack of effective therapies . TNBC does not respond to traditional hormone therapy, and chemotherapy and radiotherapy are not always effective at treating TNBC [3, 4]. It is important to identify specific therapeutic targets and to develop effective targeted therapies. Apoptosis is the process of programmed cell death and plays an important role in cancer development. Cancer cells evade apoptosis by up-regulating the expression of anti-apoptotic proteins . NF-κB activation plays a critical role in cancer cell survival [6, 7] because NF-κB activates a number of anti-apoptotic proteins, including Mcl-1, XIAP and Survivin . It has been reported that HER2-targeting drugs constitutively activate NF-κB, leading to drug resistance . New natural compounds extracted from medicinal plants provide important novel resources to develop anti-cancer drugs for TNBC. Previously, we demonstrated that Cucurbitacin E (CuE) significantly inhibits TNBC cell growth by inducing cell cycle G2/M phase arrest and apoptosis . Cimicifuga racemosa is a common herb that is frequently used as an alternative to estrogen-based replacement therapies to relieve menopausal symptoms or as a detoxification agent . It has been reported that compounds from C. racemosa inhibit the proliferation of breast cancer cell lines [12, 13] and the LNCaP prostate cancer cell line [14, 15]. The extract from C. racemosa and tamoxifen synergistically inhibited the cell growth of MCF7 and MDA-MB-231 cell lines [16, 17]. Similarly, the extract from C. foetida inhibits the proliferation of hepatocellular cells by triggering cell cycle G2/M arrest and apoptosis . Total triterpenoid glycosides of C. dahurica induce G0/G1 cell cycle arrest at lower concentrations (25 μg/ml) and trigger G2/M arrest and apoptosis at higher concentrations (50 and 100 μg/ml, respectively) in HepG2 cells . Cimicifugoside, a triterpenoid isolated from C. simplex, inhibits nucleoside transport and the growth of human leukemia U937 cells and synergistically potentiates the cytotoxicity of methotrexate . Einbond L et al. purified components from C. racemosa and found that the triterpene glycoside Actein inhibits growth, induces cell cycle arrest and decreases the expression levels of Cyclin D1 and CDK4 in MCF7 . Additionally, Actein and Doxorubicin or 5'-FU synergistically inhibit the growth of MDA-MB-453 . Further investigation indicated that Actein activates the stress response pathway by inducing the expression of ATF3 . Actein potentiates digitoxin's inhibitory effect on Na+K+-ATPase activity and MDA-MB-453 cell growth . Actein (40 μg/ml) inhibits NF-κB activity and the expression of Cyclin D1 . A triterpenoid glycoside isolated from C. racemosa, ACCX, inhibits the NF-κB and ERK pathways and osteoclastogenesis induced by either RANKL or TNFα. KHF16 (24-acetylisodahurinol-3-O-β-D-xylopyranoside) is a dahurinol-type cycloartane triterpenoid that was first isolated and identified from the rhizomes of C. racemosa collected in Finzelberg GmbH & Co. KG, Andernach, Germany. The cytotoxicity of KHF16 in cancer cells has never been tested. In this study, we screened 42 compounds extracted from Cimicifuga in MCF7 and MDA-MB-231 breast cancer cell lines. Six compounds with an IC50 less than 10 μM were further examined in six cancer cell lines. KHF16 was selected for further investigation in TNBC cell lines because of its novel chemical structure and potent anticancer activity. KHF16 dramatically induced G2/M phase cell cycle arrest and apoptosis in the MDA-MB-468 and SW527 cell lines. We demonstrated that KHF16 remarkably decreased the protein levels of XIAP, Survivin and Mcl-1 and blocked the TNFα-induced NF‑κB pathway. 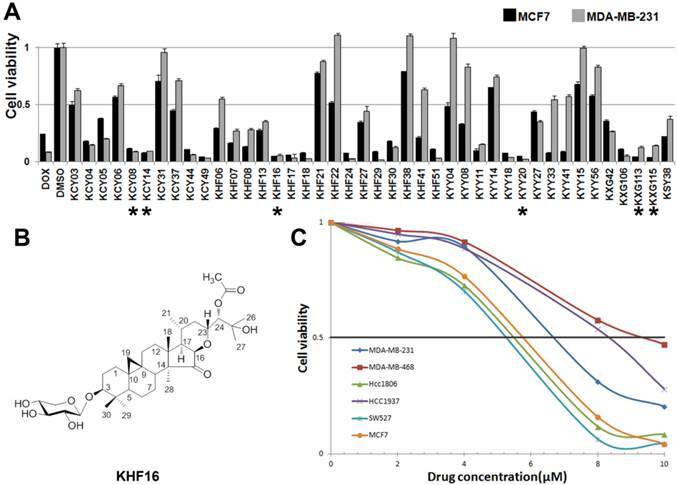 These findings suggest that KHF16 is a new inhibitor of the NF‑κB signaling pathway and may be able to be developed as a therapeutic agent for TNBC and other cancers. Rhizomes of C. yunnanensis (9 kg) were collected from Shangri-La, Yunnan province, China, in 2005. The roots of C. foetida (10 kg) were collected from Heze, Guizhou province, China, in 2006. The aerial parts of C. foetida (10 kg) were collected from Shangri-La, Yunnan province, China, in 2007. The roots of C. dahurica (0.9 kg) and C. heracleifolia (1 kg) were collected from Qingyuan, Liaoning province, China, in 2006. All of the plants were identified by Prof. Zongyu Wang, Kunming Institute of Botany, Chinese Academy of Science. Voucher specimens (KUN No. 200508025, 200608028, 200709004, 200609004 and 200609005) have been deposited at the State Key Laboratory of Photochemistry and Plant Resources in West China, Kunming Institute of Botany, Chinese Academy of Sciences, China. All of the aforementioned plant materials were extracted with MeOH at room temperature (except the roots of C. foetida, which were extracted with Me2CO) and were then fractionated by successive partitions with petroleum ether, EtOAc and n-BuOH. The detailed isolation methods for each compound are provided in the supplementary data. All of the cell lines used in this study were purchased from the American Type Culture Collection (ATCC). MDA-MB-231, MDA-MB-468 and SW527 were cultured in Dulbecco's Modified Eagle's Medium (DMEM). PC-3 was cultured in Ham's F-12 Medium. HCC1806, HCC1937 and NCI-N87 were cultured in RPMI-1640 medium. MCF7 was cultured in Minimum Essential Medium (MEM) with 0.01 mg/ml human recombinant insulin. All media were purchased from Hyclone (Hyclone, Logan, UT) and supplemented with 10% FBS. All cells were maintained at 37 °C with 5% CO2 in a humidified atmosphere. The anti-PARP, Survivin, Mcl-1, XIAP, Bcl-2, Bcl-XL, p15, p21, Cyclin D1, p-IKKα/β, IKKα, IKKβ, p-IκBα, IκBα, p-JNK, JNK, p65, Tubulin, RelB, Caspases-7 and -8, cleaved Caspase-7 and -8 antibodies were purchased from Cell Signaling (Cell Signaling Technology, Danvers, MA). The anti-Cyclin B1 antibody was purchased from Abnova (Abnova, Taipei, Taiwan). The anti-Cyclin E1 antibody was purchased from Zymed (Zymed, San Francisco, CA). The anti-p27 antibody was purchased from Becton Dickinson (BD, San Diego, CA). The anti-A20 antibody was purchased from eBioscience (eBioscience, San Diego, CA). The anti-histone H3 antibody was purchased from Abcam (Abcam, Cambridge, UK). The anti-Caspase-3 and cleaved Caspase-3 antibodies were purchased from Imagenex (Imagenes, San Diego, CA). The anti-β-actin antibody was purchased from Sigma (Sigma, St. Louis, MO). The MDA-MB-468 and SW527 cell lysate was subjected to SDS-PAGE and transferred onto polyvinylidene fluoride (PVDF) membranes. The membranes were incubated with diluted primary antibodies, horseradish peroxidase (HRP) conjugated secondary antibodies (Jackson ImmunoResearch Laboratory, West Grove, PA), and Western Lighting Chemiluminescence Reagent Plus (PerkinElmer Life Sciences, Shelton, CT) and were visualized on an ImageQuant LAS4000 Biomolecular imager to determine the expression levels of specific proteins. Cell viability was measured with the Sulforhodamine B (SRB, Sigma, St. Louis, MO) assay. In brief, cancer cells were seeded in 96-well plates at 2,000 cells/well. After 24 h, the cells were treated with 42 compounds isolated from Cimicifuga (10 μM) for 48 h. The cells were then fixed with 100 μl of 10% trichloroacetic acid for 60 min and then washed 5 times with deionized water. The cells were stained with 50 μl of 0.4% (W/V) SRB in 1% acetic acid for 5 min. The plates were washed 5 times with 1% acetic acid and dried. Finally, 100 μl of 10 mM Tris base were added to each well. Optical densities at 530 nm were measured by a spectrophotometric plate reader. Cell proliferation of MDA-MB-468 and SW527 was measured with a Click-iT EdU micro plate assay kit (Invitrogen, Carlsbad, CA) according to the manufacturer's protocol. MDA-MB-468 and SW527 cells were digested, harvested and washed twice with PBS. BD Cytofix/Cytoperm™ solution (BD, San Diego, CA) was used for simultaneous fixation and permeabilization. A total of 6×105 cells were thoroughly resuspended in 150 μl of BD Cytofix/Cytoperm solution. After incubation for 20 min at 4 ℃, the cells were washed twice with BD Perm/Wash™ buffer and incubated with 200 μl of dyeing buffer containing 0.1 mg/ml propidium iodide and 2 mg/ml RNase A for 30 min at 37℃ in dark. Finally, the cells were analyzed by flow cytometry. MDA-MB-468 and SW527 cells were treated with different concentrations of KHF16 for 24 or 48 h. Doxorubicin (Sigma, St. Louis, MO) was used as the positive control. The cells were stained with anti-Annexin V antibody (eBioscience, San Diego, CA) and 7-AAD (BD, San Diego, CA). Finally, the cells were analyzed by flow cytometry. MDA-MB-468 and SW527 cells were co-transfected in a 24-well plate (1.4×105 each well) with 950 ng of NF-κB-Luc reporter plasmid together with 50 ng of pRL-CMV (Renilla) using Lipofectamine 2000 (Invitrogen, Carlsbad, CA). The cells were cultured in serum free DMEM with or without KHF16 (10 μM) for 4 h and were treated with TNFα (10 ng/ml) for different times. The cells were lysed in the reporter lysis buffer (Promega, Madison, WI). Firefly and Renilla luciferase activities were measured consecutively using the dual luciferase assay kit (Promega, Madison, WI) with the Infinite® 200 PRO (Tecan, Durham, NC). MDA-MB-468 and SW527 cells were digested, washed twice with cold PBS, and harvested by centrifuging for 5 min at 250 g (4 ℃). The cells were incubated in 150 μl of Cytoplasm Lysis Buffer (5 mM PIPES pH 8.0, 85 mM KCl, 0.5% NP40, and 1% protease inhibitor cocktail (P-8340, Sigma, St. Louis, MO)) for 10 min at 4℃. The supernatant obtained by centrifuging is the cytoplasmic protein fraction. The pellet was washed once with the Cytoplasm Lysis Buffer and extracted using 60 μl of Nuclear Lysis Buffer (50 mM Tris-HCl pH 8.1, 10 mM EDTA, 1% SDS, 1% (P-8340, Sigma, St. Louis, MO)) with a 30 min vortex. The SW527 cells were seeded at 5×104 per well in 4-well chamber slides (Millicell EZ Slide, Millipore, Bedford, MA). The cells were treated with or without KHF16 (10 μM) for 4 h and TNFα (10 ng/ml) for 6 h in serum free media. The cells were fixed with cold 100% methanol (store at -20 ℃) for 2 min, washed with 800 μl of PBS 3 times (5 min each) and blocked with 2% BSA for 1 h. Each slide was incubated with 200 μl of diluted primary anti-p65 antibody (1:400 in PBS buffer with 2% BSA) overnight in a refrigerator. Each slide was rinsed with 500 μl of PBS three times and subjected to 200 μl of Alexa Fluor 568 labeled secondary antibody (1:1000 diluted in PBS buffer with 2% BSA) for 2 h in the dark. The slides were washed with PBS 5 times and were incubated with DAPI (Invitrogen, Carlsbad, CA, 1:1000 diluted in PBS buffer with 2% BSA) for 3 min in the dark. The slides were washed with 500 μl of PBS 3 times and were mounted. Images were taken using a confocal microscopy. All of the experiments were repeated at least three times. The values are expressed as the mean ± standard deviation (SD) and were analyzed by the Student's t test. P values less than 0.05 were considered to be statistically significant. To identify new anti-cancer compounds extracted from Cimicifuga, we treated two human cancer cell lines (the ERα positive breast cancer cell line MCF7 and the TNBC cell line MDA-MB-231) with 42 compounds (10 μM) for two days and measured the cell viability using the SRB assay. Of the 42 tested compounds, considering novelty, solubility and natural abundance factors, we chose KHF16 and five other compounds (KCY08, KCY14, KYY20, KXG113 and KXG115) that dramatically reduced the cell viability in both breast cancer cell lines compared to DMSO (Figure 1A). Then, we examined the half maximal inhibitory concentrations (IC50) of these six compounds in three breast cancer cell lines (MCF7, MDA-MB-231 and MDA-MB-468), two osteosarcoma cell lines (Saos-2 and MG-63), the liver carcinoma cell line HepG2, the prostate cancer cell line PC-3 and the gastric carcinoma cell line NCI-N87. KHF16 (Figure 1B) appeared to be the most potent of these six compounds (Table 1). KHF16 was the most cytotoxic to all three breast cancer cell lines (MCF7, IC50=5.6 μM; MDA-MB-231, IC50=6.8 μM; and MDA-MB-468, IC50=9.2 μM, Table 1). We further tested the cytotoxicity of KHF16 in three additional TNBC cell lines (HCC1806, HCC1937, and SW527) and found that KHF16 inhibited the growth of all six breast cancer cell lines in a dose-dependent manner (Figure 1C). The SW527 cell line was the most sensitive cell line toward KHF16 (Figure 1C). The IC50 value of KHF16 ranged from 5 to 10 μM in the six breast cancer cell lines. The identification of KHF16 as a potent anti-cancer compound in TNBC cell lines. A. The MCF7 and MDA-MB-231 breast cancer cell lines were treated with 42 different compounds (10 μM) extracted from Cimicifuga for two days. Cell viability was measured with the SRB assay. DMSO was used as the negative control. Doxorubicin was used as the positive control. The six compounds labeled with an asterisk were selected for further study. B. The chemical structure of KHF16. C. Five different TNBC breast cancer cell lines and MCF7 were treated with different concentrations (0-10 μM) of KHF16 for 48 h. Cell viability was measured with the SRB assay. The IC50 values (μM) of six compounds in 8 cancer cell lines. Cancer cells were treated with these compounds individually for two days. The cell viability was measured by the SRB assay. 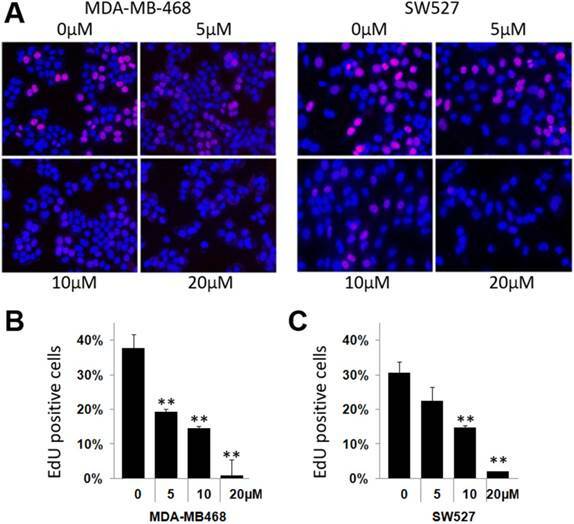 To investigate whether KHF16 inhibits cell proliferation in TNBC cell lines, we chose the MDA-MB-468 and SW527 cell lines to measure DNA synthesis using the EdU incorporation assay. As shown in Figure 2, KHF16 (5-20 μM) significantly inhibited DNA synthesis in both cancer cell lines in a dose dependent manner (Figure 2A-C). Because KHF16 inhibited cell proliferation, it is likely that KHF16 causes cell cycle arrest. To test this theory, we treated the MDA-MB-468 and SW527 cells with KHF16 (5-20 μM) for 24 h and measured the cell cycle distribution. Indeed, the percentage of cells in the G2/M phase was significantly increased by the administration of KHF16 in a dose dependent manner in both the MDA-MB-468 and SW527 cell lines (Figures 3A-C). The percentages of cells in the G1 and S phases were significantly decreased (data not shown). KHF16 dramatically decreased cell viability within two days, suggesting that KHF16 mainly induces cell death in addition to causing cell cycle arrest. We observed that most KHF16 (10 μM) treated MDA-MB-468 and SW527 cells became round, detached, and died after 24 h (Figure 4A). It appears that the cancer cells underwent apoptosis after KHF16 treatment. We further measured the apoptosis of MDA-MB-468 and SW527 cells by Annexin V/7-AAD staining and flow cytometry. 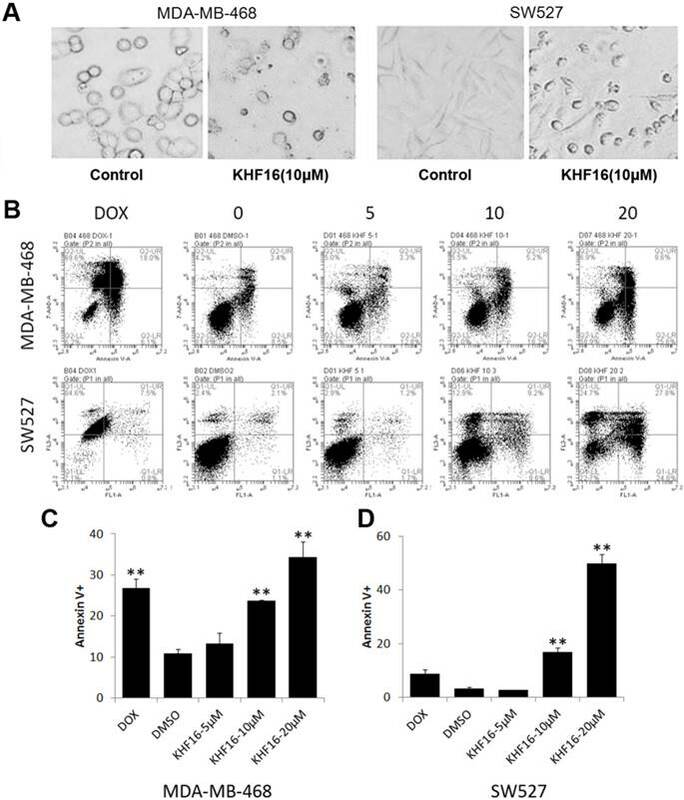 KHF16 (10-20 μM) significantly induced Annexin V positive apoptotic cells in both the MDA-MB-468 and SW527 cell lines (Figures 4B-D). Moreover, KHF16 induced the cleavage of Caspase-8, Caspase-3, Caspase-7 and PARP in both cell lines (Figure 5 and Figure S1). 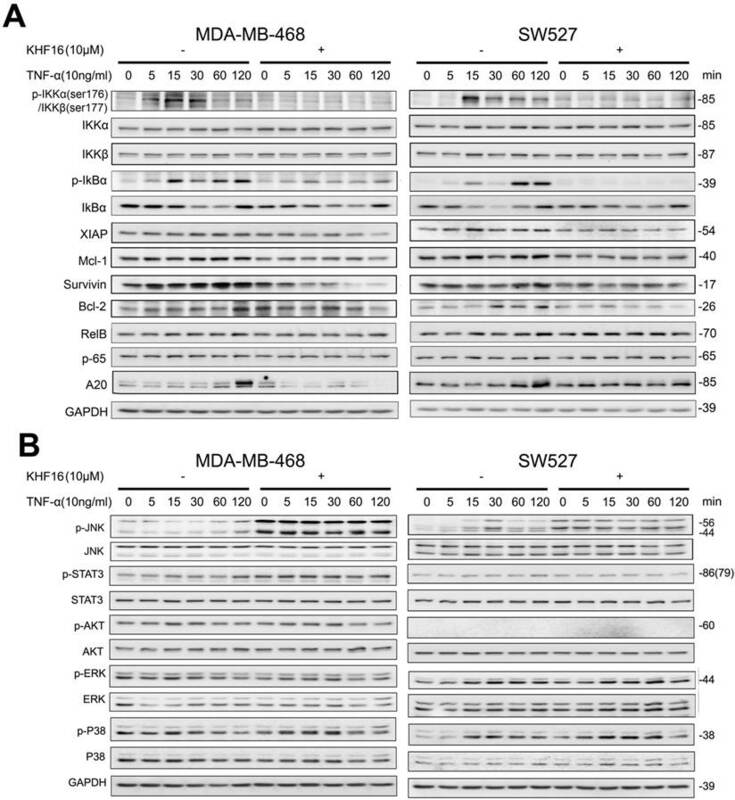 KHF16 suppresses DNA synthesis in the MDA-MB-468 and SW527 cell lines. A. KHF16 (5/10/20 μM) was used to treat the MDA-MB-468 and SW527 cells for 24 h. DNA synthesis was measured by the EdU assay. B. The quantitative data of panel A (MDA-MB-468 cells). Percentages of EdU-positive proliferating cells vs. total cells are shown. * p < 0.05, ** p < 0.01, t-test. C. Quantitative data of panel A (SW527 cells). 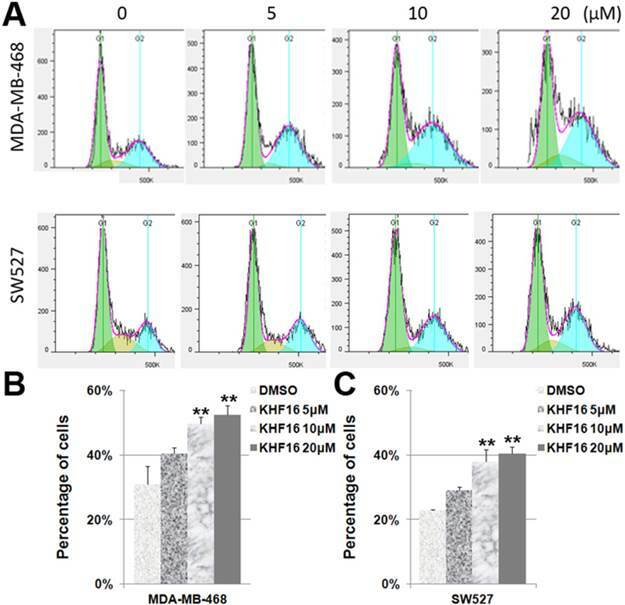 KHF16 induces cell cycle G2/M arrest in MDA-MB-468 and SW527. A. MDA-MB-468 and SW527 cells were treated with KHF16 (5/10/20 μM) for 24 h. The cell cycle distribution was analyzed by FlowJo software (version 7.6). B. KHF16 (10/20 μM) significantly increased the percentage of G2/M phase MDA-MB-468 cells compared to DMSO. ** p < 0.01. C. KHF16 (10/20 μM) significantly increased the percentage of G2/M phase SW527 cells compared to DMSO. ** p < 0.01. Because KHF16 induced G2/M cell cycle arrest and apoptosis, we examined the protein levels of several cell cycle and apoptosis regulators. 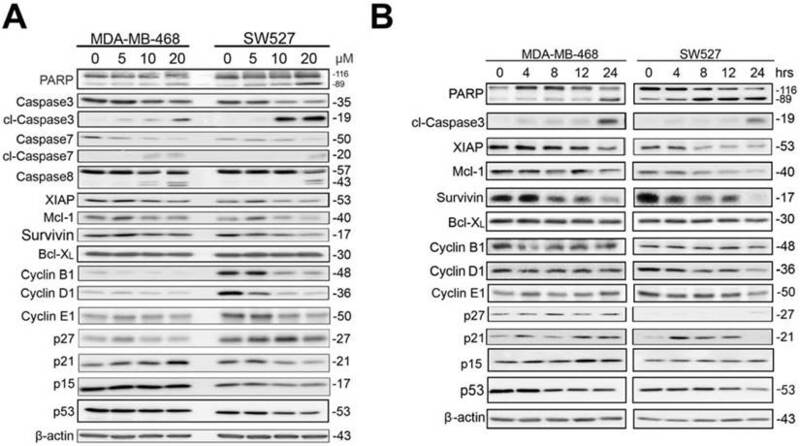 In both the MDA-MB-468 and SW527 cell lines, KHF16 treatment increased the expression levels of cyclin dependent kinase inhibitor p21 (Figure 5 and Figure S1). Likewise, KHF16 decreased the protein levels of several anti-apoptotic proteins, including XIAP, Mcl-1 and Survivin, but not Bcl-XL, in dose and time dependent manners (Figure 5 and Figure S1). KHF16 shares a similar chemical structure with ACCX, which inhibits the NF-κB and ERK signaling pathways induced by either RANKL or TNFα . It is well known that the NF-κB signaling pathway inhibits apoptosis by inducing the expression of anti-apoptotic proteins, such as XIAP, Mcl-1 and Survivin [26, 27]. To understand the mechanism by which KHF16 inhibits the expression of anti-apoptotic proteins, we tested whether KHF16 inhibits the NF-κB signaling pathway. As expected, TNFα (10 ng/ml) activates the NF-κB signaling pathway in both the MDA-MB-468 and SW527 cell lines, as indicated by the phosphorylation of IKKα/β and IKBα, the degradation of IKBα and the induction of XIAP, Mcl-1, Survivin, Bcl-2 and A20 proteins (Figure 6A and Figure S2A). KHF16 (10 μM) almost completely blocked the phosphorylation of IKKα/β and IKBα, the degradation of IKBα and the induction of XIAP, Mcl-1, Survivin, Bcl-2 and A20 proteins (Figure 6A and Figure S2A). KHF16 did not affect the protein levels of RelB and p65 in both cell lines (Figures 6A and Figure S2A). Interestingly, KHF16 upregulated the protein levels of pJNK, but not pERK, p38, pAKT and pSTAT3 (Figure 6B and Figure S2B). RelA (p65) nuclear translocation is a symbol for NF-κB activation. 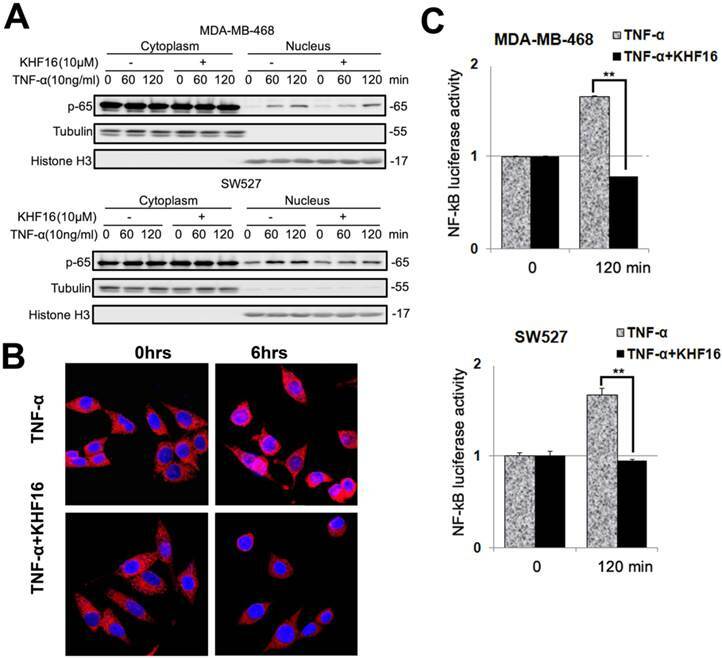 We further evaluated whether KHF16 inhibits TNFα-induced p65 nuclear translocation in MDA-MB-468 or SW527 cells. As indicated in Figure 7A, KHF16 inhibited TNFα-induced p65 nuclear translocation at 60 to 120 min in both cell lines. We confirmed these results by performing p65 immunofluorescence staining. TNFα (10 ng/ml) induced p65 nuclear translocation in SW527 at 6 h (Figure 7B). KHF16 (10 μM) significantly blocked TNFα-induced p65 nuclear translocation (Figure 7B). To test whether RelA contributes to KHF16-mediated loss of cell viability, we knocked down RelA by siRNA in both MDA-MB-468 and SW527 cell lines, treated the cells with KHF16, and measured cell viability. As shown in Figure S3, RelA-deficient cancer cells were partially resistant to KHF16 as measured by the SRB assay. These results suggest that KHF16 functions partially through RelA. KHF16 induces apoptosis in MDA-MB-468 and SW527. A. MDA-MB-468 and SW527 cell morphology changed dramatically after the cells were treated with KHF16 (20 μM) for 24 h. B. MDA-MB-468 and SW527 cells were treated with KHF16 (5/10/20 μM) for 24 h, stained with Annexin V/7AAD and analyzed by flow cytometry. Doxorubicin was used as the positive control. C. The quantitative data of panel B (MDA-MB-468 cells). The percentages of Annexin V-positive cells are shown. ** p < 0.01. D. The quantitative data of panel B (SW527 cells). KHF16 decreases the protein expression levels of multiple cell cycle and apoptosis regulators in MDA-MB-468 and SW527. A. MDA-MB-468 and SW527 cells were treated with KHF16 (5/10/20 μM) for 24 h. Cell lysates were collected for WB to detect cleaved Caspase-3, -7, -8 and PARP, Survivin, XIAP, Mcl-1, Bcl-XL, Cyclin B1, D1 and E1, p21, p27, p15 and p53. β-actin was used as the loading control. The quantification data is listed in Supplementary Figure 1. B. MDA-MB-468 and SW527 cells were treated with KHF16 (10 μM) for 0, 4, 8, 12 and 24 h. The cell lysates were collected for WB to detect cleaved Caspase-3 and PARP, XIAP, Mcl-1, Survivin, Bcl-XL, Cyclin B1, D1, and E1, p21, p27, p15 and p53. β-actin was used as the loading control. The quantification data is listed in Supplementary Figure 1. Next, we performed the NF-κB-Luc luciferase reporter assay in MDA-MB-468 and SW527 cells. TNFα (10 ng/ml) significantly activated the NF-κB-Luc reporter at 120 min, and KHF16 (10 μM) almost completely blocked TNFα-induced NF-κB activation (Figure 7C). To test whether KHF16 also blocks NF-κB activation in response to other stimuli, we isolate mouse splenocytes and treated the cells with PMA plus ionomycin and KHF16. We found that KHF16 is not toxic to mouse splenocytes (Figure S4A). KHF16 completely inhibited the induction of IFNγ by PMA/Ionomycin as measured by qRT-PCR (Figure Figure S4B). These results indicate that KHF16 has no toxic effect on normal splenocytes but it blocks the NF‑κB dependent immune response. In this study, we examined the cytotoxicity of 42 compounds extracted from Cimicifuga spp in two different breast cancer cell lines and identified a cycloartane triterpenoid, KHF16, as the most potent anti-cancer compound among five TNBC cell lines and other cancer cell lines (IC50<10 μM). KHF16 inhibited TNBC cell proliferation by decreasing the protein levels of cyclin B1 and D1 and by inducing G2/M cell cycle arrest. More importantly, KHF16 induced apoptosis of TNBC cells by decreasing the anti-apoptotic protein levels of XIAP, Mcl-1 and Survivin. We demonstrated that KHF16 inhibited the activation of the TNFα-induced NF-κB signaling pathway and the induction of these anti-apoptotic proteins. KHF16 is a cycloartane triterpenoid extracted from C. foetida. In this study, KHF16 also showed great cytotoxicity in several cancer cell lines from the breast, prostate, stomach, liver, and bone (Table 1). KHF16 most likely inhibits cancer through the inhibition of the NF-κB signaling pathway. NF-κB activity is commonly elevated in breast cancer [28-30], prostate cancer [31, 32], gastric cancer , pancreatic cancer , oral cancer , and colorectal cancer , among others. The activation of the NF-κB signaling pathway is appreciated as a key mechanism for cell proliferation [36-38] and apoptosis resistance [39-42]. NF‑κB has been reported to inhibit apoptosis by inducing the expression of inhibitors of apoptosis (XIAP, Mcl-1 and Survivin) [43-46]. However, NF‑κB also induces apoptosis through upregulating the expression of death receptors [47, 48]. We demonstrated that KHF16 inhibited the TNFα-induced expression of anti-apoptosis proteins, including XIAP, Mcl-1 and Survivin (Figure 6). In the absence of exogenous TNFα, KHF16 also decreased the expression of these anti-apoptosis proteins (Figure 5). These findings suggest that KHF16 induces apoptosis most likely through the inhibition of the NF-κB signaling pathway. We demonstrated that KHF16 inhibited TNFα-induced IKK phosphorylation (Figure 6). Whether KHF16 is a direct IKK inhibitor requires further investigation. KHF16 blocks the TNFα-induced NF-κB signaling pathway and anti-apoptosis protein expression in MDA-MB-468 and SW527. A. MDA-MB-468 and SW527 cells were first treated with or without KHF16 (10 μM) for 4 h. Following that, TNFα (10 ng/ml) was added for 5 to 120 min. The cell lysates were collected for WB to detect the protein levels of p-IKKα/β, IKKα, IKKβ, p-IκBα(Ser32), IκBα, XIAP, Mcl-1, Survivin, Bcl-2, RelB, p65 and A20. GAPDH was used as the loading control. The quantification data is listed in Supplementary Figure 2. B. MDA-MB-468 and SW527 cells were treated with KHF16 and TNFα as described above, except that the TNFα treatment time points were different. p-JNK(Thr183/Tyr185), JNK, p-STAT3 (Tyr705), STAT3, p-AKT(Ser473), AKT, p-ERK(Thr202/Tyr204), ERK, p-p38(Thr180/Tyr182) and p38 protein levels were detected. The pAKT protein level was undetectable in SW527. The quantification data is listed in Supplementary Figure 2. KHF16 decreases p-65 (RelA) nuclear translocation and blocks NF-κB activation. A. MDA-MB-468 and SW527 cells were first treated with or without KHF16 (10 μM) for 4 h. Then, TNFα (10 ng/ml) was added for 60 and 120 min. The nuclear and cytoplasmic fractions were collected for p-65 detection. Tubulin and Histone H3 were used as cytoplasmic and nuclear protein controls. B. Immunofluorescence staining of p-65 (RelA) in SW527 cells. SW527 cells were stimulated with TNFα (10 ng/ml) for 6 h. KHF16 (10 μM) blocked p-65 (red) nuclear translocation. Nucleic acid was stained with DAPI (blue). C. KHF16 (10 μM) blocked TNFα (10 ng/ml)-induced NF-κB activation. Luciferase reporter assays were used to detect the NF-κB activity in MDA-MB-468 and SW527 cells. ** p < 0.01. We noticed that KHF16 significantly decreased the Cyclin B1, D1, and E1 protein levels in SW527 cells, but not in MDA-MB-468 cells (Figure 5 and Figure S1). It is well known that Cyclin D1 plays a key role in promoting cell transition from from the G1 to S phase. However, it is not rare to observe the association between the downregulation of CyclinD1 and the G2/M arrest. For examples, maple polyphenols, ginnalins A-C, can arrest the MCF7 breast cancer cells in the G2/M phase and decrease the Cyclin D1 protein level . Additionally, 17 β-estradiol and progesterone induce the G2/M arrest and the reduction of cyclin B1 and D1 in SW-13 human adrenal carcinoma cells . The mechanism by which the reduction of CyclinD1 expression contributes to the cell cycle G2/M arrest in SW527 is unknown at present. In addition to KHF16, five other compounds (KCY08, KCY14, KYY20, KXG113 and KXG115) extracted from Cimicifuga also showed potent cytotoxicity in 8 cancer cell lines (Table 1). The main reason that we did not study them in detail is because the natural abundance of these compounds is low. They are a type of cimigenol chemical, while KHF16 is a dahurinol-type, with few reports of its anti-cancer effects. Based on our study, KHF16 and ACCX have similar functions in the NF-κB signaling pathway, as ACCX belongs to the cimigenol-type, which has been widely reported to have anti-cancer effects. We are the first to demonstrate that KHF16, which is a rarely reported anti-tumor compound, significantly suppresses TNBC. This work was supported by the National Natural Science Foundation of China (81120108019 and 81325016 to Chen, C; U1192604 and 39970086 to Qiu, M.; 81560432 to Yang, R., 81402206 to Kong, Y.; 81302670 to Nian, Y.). CC, MHQ and RY designed the experiments. YK carried out most experiments and analyzed data. FL completed the extra experiments for the revision. TN extracted all compounds. ZZ provided technical support. YK and CC wrote and revised the manuscript. Corresponding authors: Ceshi Chen, chenckiz.ac.cn, Ming-Hua Qiu qiuminghuakib.ac.cn or Runxiang Yang, jenny_yrxcom.